Alaska Airlines (Seattle/Tacoma) today is expected to formally unveil this new “Employee powered” Boeing 737-800 logojet as a way of thanking its employees. Here is a sneak preview. 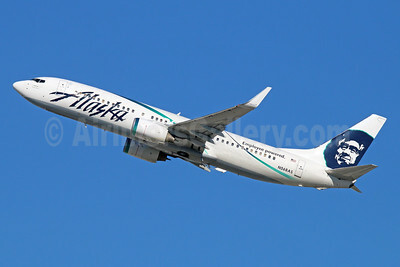 The dashes between the two stripes are signatures of employees that attended the FlightPath meetings of Alaska Airlines. Copyright Photo: Nick Dean/AirlinersGallery.com. Formerly painted in the “Follow Apolo to Hawaii” special scheme, the pictured Boeing 737-890 N568AS (msn 35183) at Paine Field in Everett, WA now wears this special color scheme dedicated to its employees. It is not a new livery for Alaska but the company has been rumored to be testing new designs to replace its current 1990 livery. This entry was posted in Alaska Airlines and tagged 35183, 737, 737-800, 737-890, Alaska Airlines, Boeing, Boeing 737, Boeing 737-800, Employee powered, employees, Everett, N568AS, PAE, Paine Field on October 8, 2013 by Bruce Drum.